To catch them is my real test, to hack them is my cause. 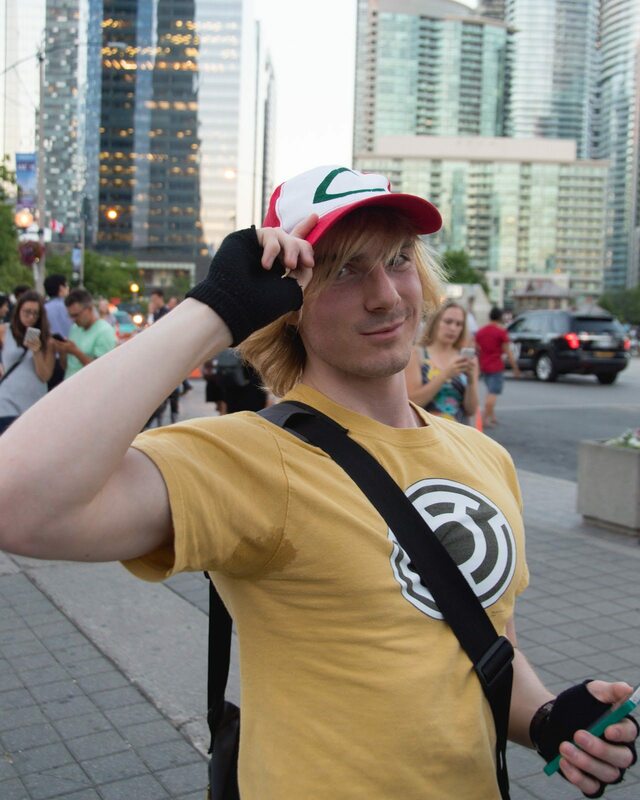 Players met up outside the CN Tower on Monday to talk strategy and show off their bulging Pokédexes after the game’s official release across Canada. Photo by Kevin Lee. A horde of gamers young and old gathered at the base of the CN Tower, Toronto’s most notable landmark in and outside of Niantic’s smash hit game Pokémon Go. They compared Pokédexes, shared locations, and made new friends among crews. It’s not an unusual scene since the game hit smartphone app stores in Canada earlier this week, and players are on the hunt to catch ’em all. But one clever Pokémon enthusiast has used his coding expertise to hunt for the rarest monsters in the game. Tharshan Muthulingam is the developer behind @PokemonTrackrTO, a Twitter account that uses homebrew code to tell players the precise coordinates of some of the city’s most elusive Pokémon, and how long they have to catch it. He built the account by reverse-engineering application program interfaces (APIs) and building on the coding skills of other Reddit users. Muthulingam first dreamed up the idea when he realized the Pokémon Go’s navigation system was not working properly. The game, which brings the Pokémon ecosystem into the real world, has a feature that allows players to find nearby Pokémon using GPS, and gives an approximation of distance by showing a number of footsteps: one step means the monster is close, two means it’s a short walk away, and three means it’s about a hike away. But players have noticed that it’s often inaccurate. “Whichever direction you go in the app always shows three steps, so it’s almost impossible to find anything,” Muthulingam says. He thinks the developers have temporarily disabled the feature, forcing the game to abandon the step metric, because it puts their servers under an unmanageable amount of stress. Instead, by tweaking the game’s APIs, Muthulingam has found a workaround to this navigation problem, using latitude and longitude coordinates taken directly from his phone. “It’s basically a replacement of [the game’s broken navigation system],” he says. The Twitter account is currently only for downtown Toronto, though he says he would consider expanding it throughout the GTA is there is demand for it. Crowdsourced data is piling up as casual players and app makers try their hand at charting the GTA’s Pokémon destinations. This is a map created by players from subreddit r/PokemonGOSOntario. Yellow stick figures are gyms, red pins are locations to catch Pokémon, and white pins are Pokéstops. Muthulingam said he sees his creation as a way to improve the player experience, not just to help people cheat the game’s methods of organic discovery. While the tracker is in its early days, Muthuligam plans to expand on the service’s functionality. “I want to create a bot you can tweet at looking for a specific Pokémon, and have it tweet you back when it’s found one,” he says. 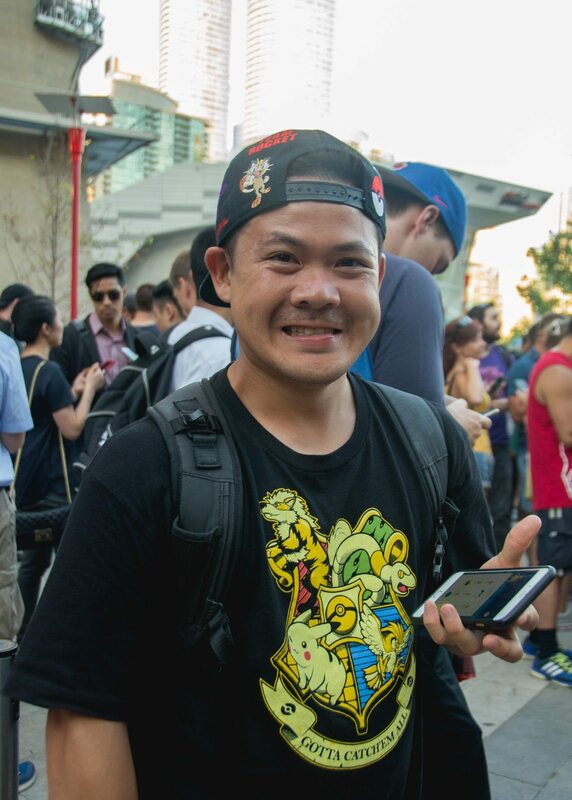 Jeffrey Li is part of Team Instinct, a faction within the game’s lore. Photo by Yvano Antonio. 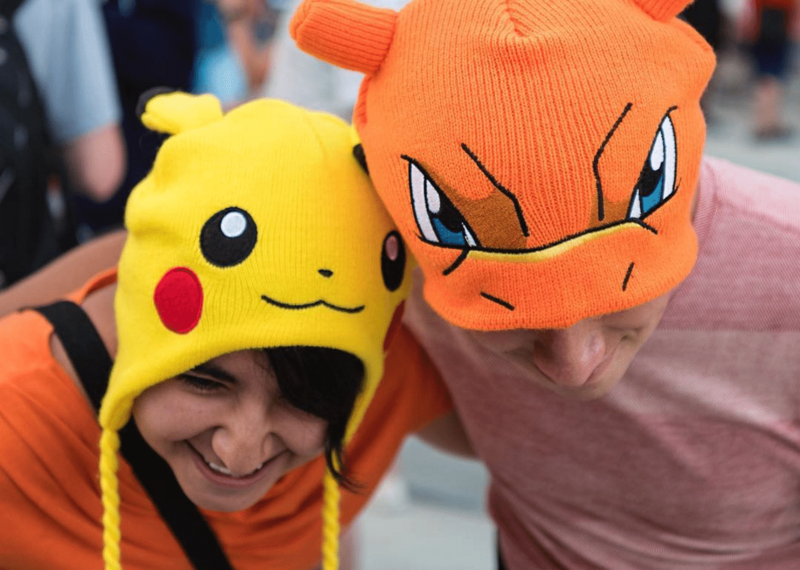 At the CN Tower meetup earlier this week, several Pokémon enthusiasts came out to play and meet other fans of the game. 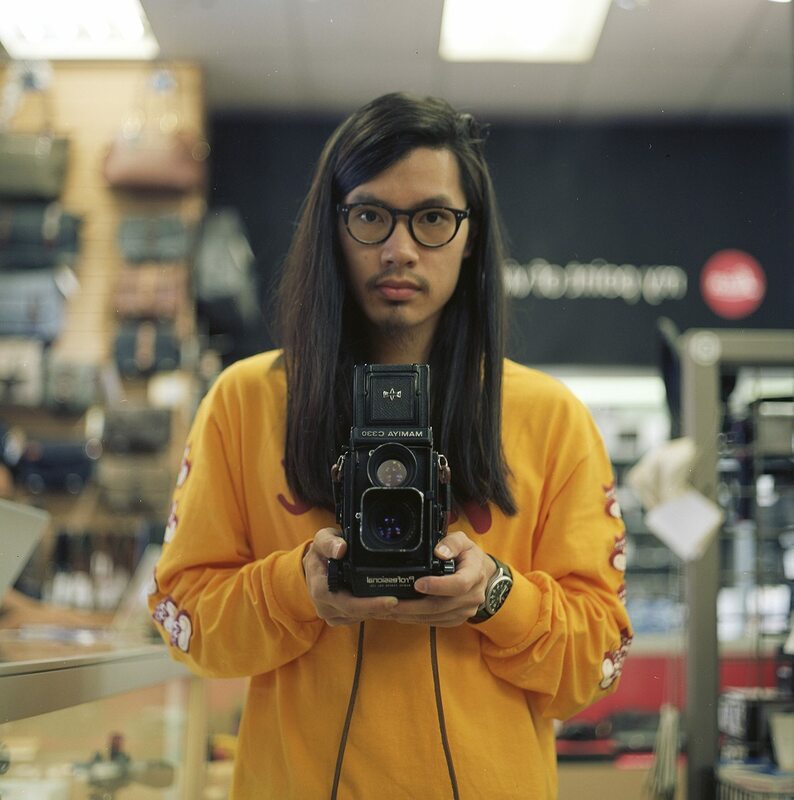 Jeffrey Li has been playing Pokémon since the release of Pokémon Ruby in 2002 on the Game Boy Advance. Li says the great thing about Pokémon Go is the lack of stigma surrounding this iteration of the game that existed on Nintendo platforms. Like many others, Li says the game has gotten him on his feet and onto transit. He commuted from Markham just to make the meetup downtown to engage with other players. 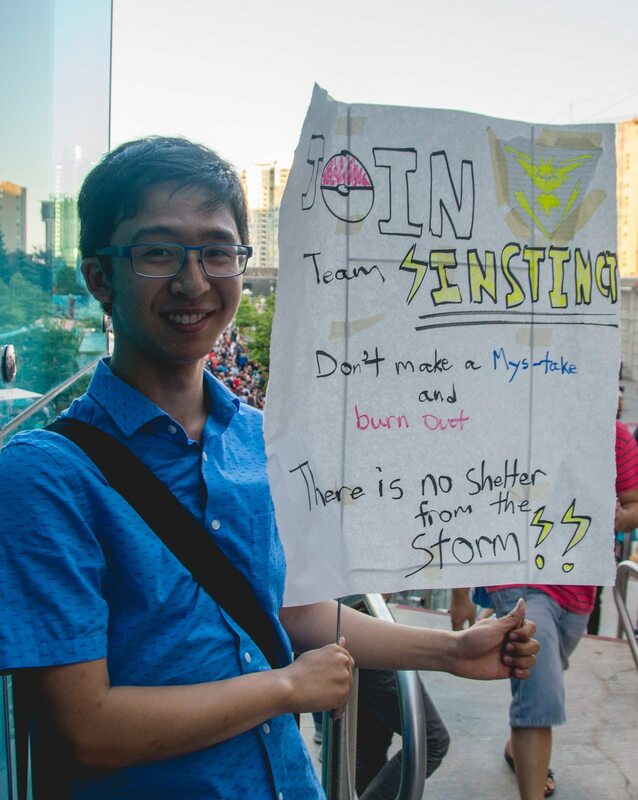 He even made a sign for members of Team Instinct, the side he represents in the game, out of spare materials at work. Lex Spratley. Photo by Yvano Antonio. Lex Spratley has played the game since the 1998 release of Pokémon Yellow for the original Game Boy Pocket. “I hope to catch the first 151 Pokémon by the end of the year, but it’ll take a few more years to catch the rest as they gradually get released,” Spratley says. Spratley has managed to stay out of trouble playing the game so far. His better judgment almost left him, on the edge of crossing a busy street to catch a Rattata, a common critter. Nam Phi Dang was at the CN Tower meetup as a fly on the wall. He was photographing the meetup because of his interest in the social factors of playing Pokémon Go. Mike Rogers. Photo by Yvano Antonio. Mike Rogers, 24, has a more laid-back approach to the game. He’s yet to explore unknown areas, but says his coworkers are certainly invested in the game. One showed up half an hour late to work. He wouldn’t answer his phone during his absence, and later confessed he’d been in a heated battle, not driving to work. Where else are they headed? 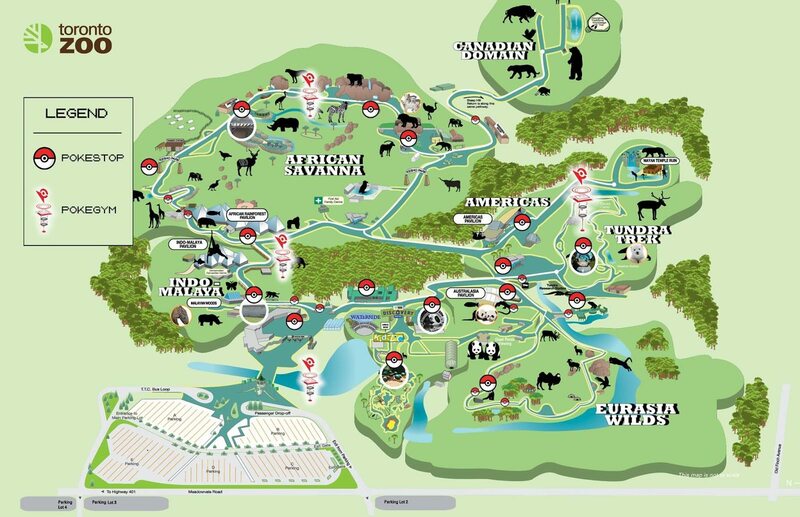 There are more than 30 Pokéstops and Gyms combined on the Zoo’s grounds. In addition to the CN Tower, several other Toronto landmarks are hotspots for Pokémon Go players. Toronto Zoo spokesperson Jennifer Tracey saw visitors playing the game in between gazes at the zoo’s real-life attractions. With more than 30 Pokémon-related points of interest on site, the zoo’s adoption of the game marries real animals with those on screen, and with great results. The idea is protect all life under the zoo’s care while promoting the fun of playing. The grounds have more plant species than animals to maintain.